If you want to reduce energy costs, protect your home in a blanket of insulation, and upgrade your Alabama home’s exterior with an amazingly beautiful exterior cladding, then we’d like to introduce you to the Prodigy® Insulated Wall System. Each Prodigy profile (Single 7, D6 Clapboard, D5 Dutch lap) offers unique benefits to lower your energy costs. And, during your free in-home demonstration, one of our certified home improvement specialists will help you decide which vinyl siding type is best suited for your lifestyle. 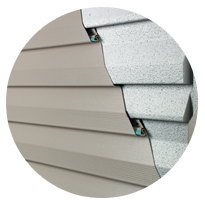 The Prodigy® Insulated Wall System is the most advanced vinyl siding on the market. Boasting the thickest EPS foam insulation on the market – up to 1-1/2” thick, Prodigy provides increased insulation value to help reduce energy costs in your home. The exterior surface provides the rigid feel, course lines, and beautiful appearance of a real wood product. And for added peace of mind, the durability of Window World of Gulf Coast’s Prodigy® Insulated Wall Vinyl Siding System will protect your home against the elements now, and for years to come. 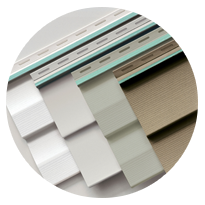 Window World of Gulf Coast’s Window World 4000 Energy Plus Vinyl Siding is engineered energy efficient to protect your home in a number of ways. Its premium 1-1/4” thick contoured insulating underlayment is designed to wrap your home securely in a blanket of insulated protection. With a Perm Rating of 5, Window World 4000 Energy Plus Vinyl Siding is not only energy efficient, but is also moisture resistant allowing your exterior walls to breathe freely. Ready to upgrade your home with new shakes and scallops? Contact Window World of Gulf Coast today for a free in-home estimate!